Sikh Buzurg named Jarnail Singh Khalsa today slapped Akali Minister Sikander Singh Malooka at village Hamirgarh where Malooka had come to gather support for Sukhbir’s rally on 23rd November. He was then arrested by Police, but Kaali Youth Brigade took him from Police and brutally beat him up. Bathinda: Punjab’s Panchayat Minister Sikandar Maluka reportedly received a heavy hand from a person named Jarnail Singh at Hamirgarh village in Bathinda district. Sources told Sikh Siyasat News (SSN) that an elderly person Jarnail Singh gave a slap to Sikandar Maluka who was in Harmirgarh village to gather support for November 23 rally of Shiromani Akali Dal (Badal) in the district. Details gathered by the SSN reveal that Jarnail Singh was later overpowered by associates of Sikandar Maluka, who beat him up badly before handing over to the police. 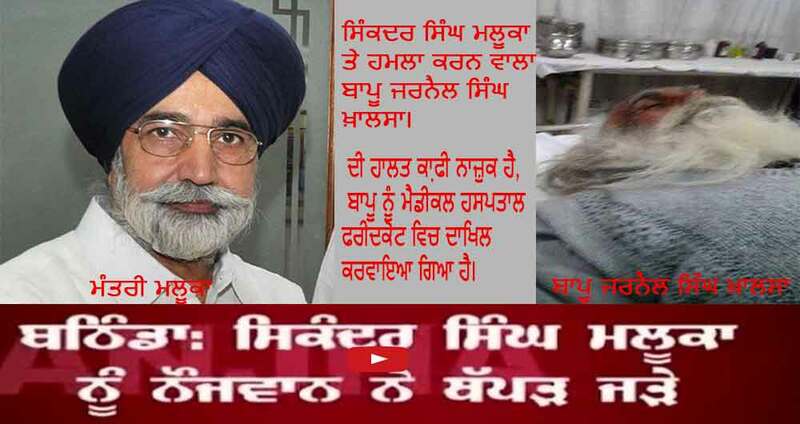 Bathinda SSP Swapan Sharma told Sikh Siyasat News (SSN) over phone that a case of “hurt” has been registered against Jarnail Singh at Rampura-Phool police station. On being asked that whether Sikandar Maluka was hurt in this incident, the SSP said that “intention of the accused was to cause hurt … and it is the intention that matters”. It is notable that minister Sikandar Maluka has been at the horns of controversies for past few months. During his recent visit to Canada he faced stiff opposition form Sikh diaspora and Punjabi NRI sections. He was slammed by a Canadian minister for baselessly criticising the Canadian police. Sikandar Maluka is known for beating up unemployed youth, including women, during a rally of SAD (Badal) at Bathinda. Maluka’s associates were in news for beating up villagers, including women, who were protesting against alleged anti-farmer policies of the Badal government. Dera Sirsa Followers Collect Weapons in Dera | Sikhs Should be Alert ! !